In online retail the product page can be seen as the most important page on a website. This page has several purposes it can be a landing page, an upsell opportunity but more importantly the page should start the customer on the order process. In this post I will look at three different strategies which will help you improve your product page. It’s important that every page on a site has a goal whether it’s to shows your range of products or promote your brand. On the product page the main goal should be to get the customer complete to the sale. This is why the call to action is so important. There should not be any confusion the customer should know straight away where to start the sale process. I think the Comet site ticks all the right boxes for a product page. The heading title stands outs clear and clean. The same goes for the price and the breadcrumb navigation. On the comet product page they have two main call to actions buy online or collect in store. The colours of both of these are a different palette to the rest of the page as they are blue. They’re position on the right so they stand out without any other page distractions. I am a huge fan of the HMV site on a whole their website has a lot of engaging elements on the product page such as video, tell a friend lightbox and the associated products. But the call to action button on this page, I think somewhat gets lost amongst the page. The site uses a lot of pink style palette so the add to basket button is not as clear as it could be. In basic terms you as a customer decide to buy a certain CD based on a recommendation from a friend. This is what this is in ecommerce but on a blown up scale. Examples of this are customer reviews, ease of fits and questions and answers. Seo – You are getting unique potentially keyword rich user generated content on the page. Reduce contact centre resources – If your contact centre team has a lot product enquires you can help levitate if customer write good reviews. Decrease returns – For example if your site sells flat pack furniture which is difficult to follow the instructions. A customer could write a review about the product saying a great piece of furniture but difficult to set up. If the person is diy shy person Duane Blake they would then avoid that purchase and look for another product. Argos reviews use a category system. So a customer can see how their potential purchase rates against different criteria. 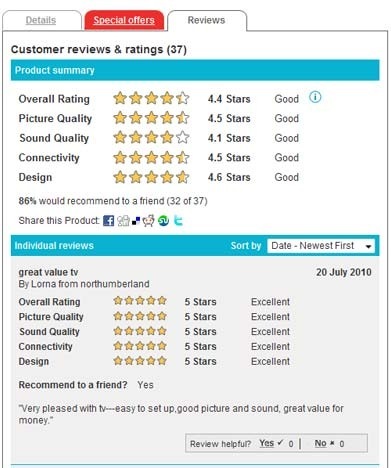 Their ratings are out of five stars in the TV section of the site they rate the TV up to 5 stars in design, connectivity, sound quality, picture quality and overall quality. The customer at a glance can see if the product is suitable. I couldn’t talk about Social Proofing without mentioning the godfather of ecommerce. 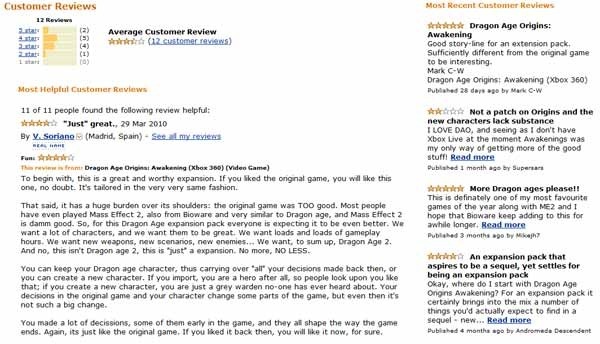 I don’t agree with everything what Amazon does eg Adverts to other sites. But what it does with its customer reviews it does well. They provide full customer reviews in the main page content and in the side bar they then provide truncated customer reviews. If you do decide to use this sort of system on your site its worth mentioning its important keeping the negative reviews. As customers do look out for negative reviews on a product as too many positive reviews can make the product seem non genuine to good to be true. What I mean by this is product videos, good product description and a different ranges of images all these help the customer envision having the product. Firebox is a great site which provides customers with rich meaningful content all their content is written in the tone of their target customer. They also show examples of how to use the product and demos what the product can do. All these will help the customer in the decision buying process. Brownie points for firebox they also allow their customers to upload video, photos and submit reviews to the site. 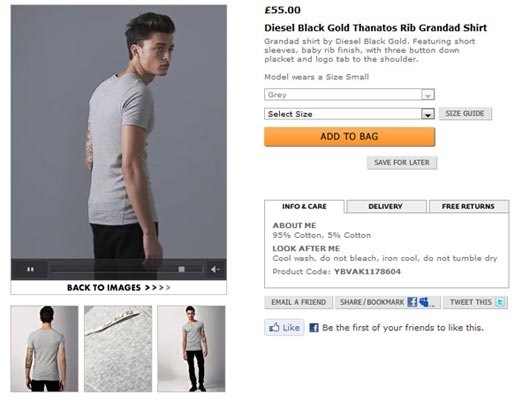 Asos continues to innovate with rich Meta content which the customer will genuinely find useful. For example their info and care tab provides the customer instructions in how to wash their product. But the feature I particularly like their video feature it shows a person modelling the product on the catwalk. Upsell, upsell, upsell similar product and related products are great to boost sales on your site. 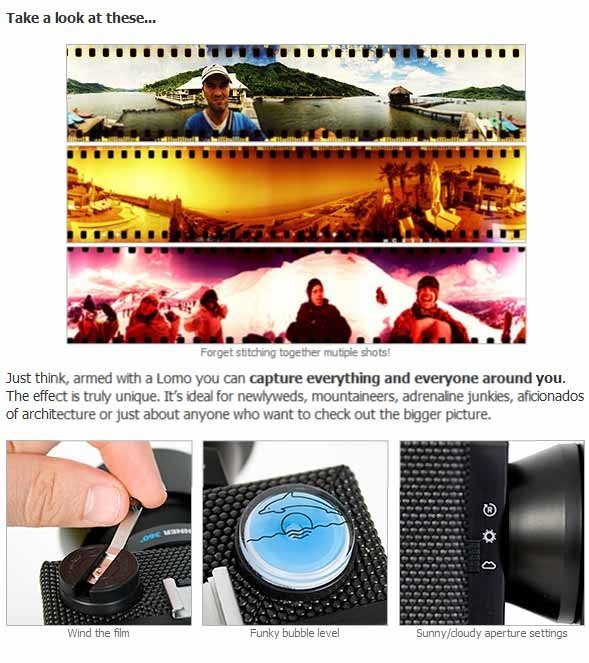 For example you buy a new Camera why not on your product page have a associated product have some camera case chances are your customers may just add one to their order. But related products and associated products are great it’s important to have them visible on the screen where the customer can see not hidden away on a separate tab. 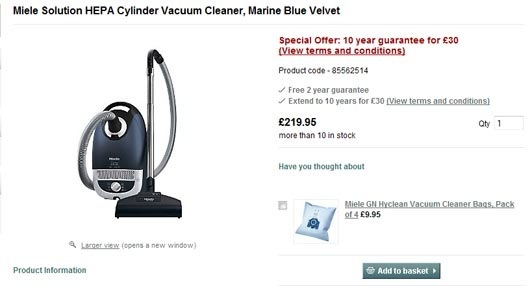 The John Lewis site does an excellent example of up selling when buying a vacuum cleaner they give the customer the opportunity to purchase some vacuum bags for that vacuum model. As it is more than certain a customer will need a new vacuum bag for this purchase. They’re also put the product in a great position just above the add to basket button.